This study was to compare the success of resin-modified Portland cement-based material (TheraCal) with MTA in direct pulp capping (DPC) of primary molars. 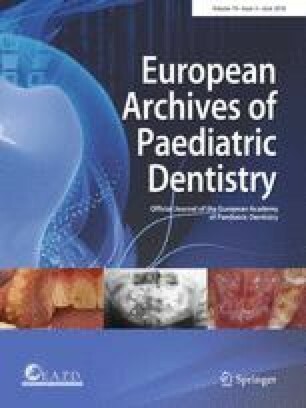 Symmetrical bilateral primary molars (92) from 46 healthy subjects aged 5–7 years were included in this split-mouth randomised clinical trial. DPC for small non-contaminated pulp exposures using either TheraCal or MTA were randomly performed in symmetrical molars. Thereafter, teeth were restored with amalgam. Clinical and radiographic evaluations were performed at 6 and 12 month follow-ups. Data were analysed using Chi square test at a significance level of 0.05. At the final follow-up session 74 teeth were available. After 12 months, the overall success rates for MTA and TheraCal were 94.5 and 91.8%, respectively. The difference between outcomes of the two groups was not statistically significant (P > 0.05). Within the limitations of the current study, radiographic and clinical findings revealed that TheraCal exhibited a comparable outcome to MTA in DPC of primary molars after 12 months. This study was supported by Tabriz University of Medical Sciences. Special thanks to the staff at the Department of Paediatric Dentistry, and the children and parents for their participating in this study. Professor Leila Erfanparast declares that she has no conflict of interest with respect to the authorship and/or publication of this paper. Dr. Parastoo Iranparvar declares that she has no conflict of interest with respect to the authorship and/or publication of this paper. Professor Ali Vafaei declares that he has no conflict of interest with respect to the authorship and/or publication of this paper. 5–7 years old children were included in our study. All procedures performed in this study which involved human participants were in accordance with the ethical standards of the “Committee for Ethics in Research on Humans” at Tabriz University of Medical Sciences (Trial no. IR.TBZMED.REC.1395.994) and with the 1964 Helsinki Declaration of Human Rights and its later amendments or comparable ethical standards. Each experiment was included in the study after reading, understanding, and completing the written informed consent document by his/her parent.